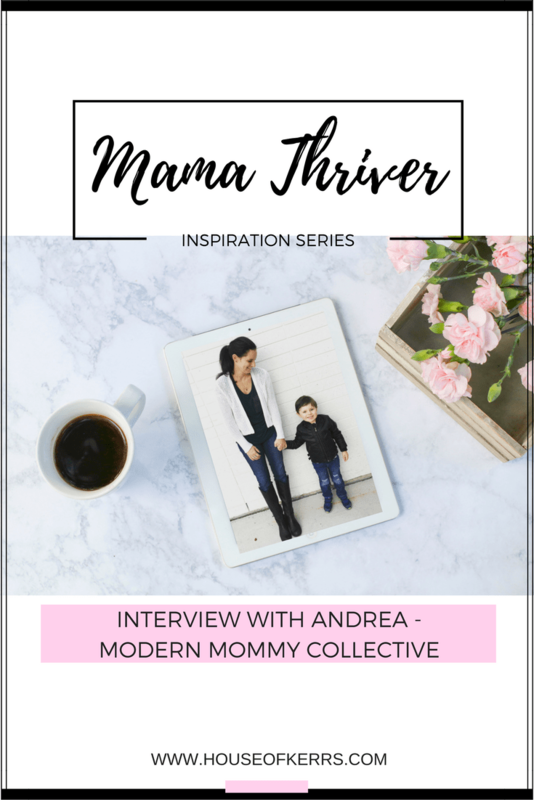 Today on our Mama Thriver Inspiration series I’m excited to feature Andrea of Modern Mommy Collective. Andrea is a Mom of two and runs the Modern Mommy Collective platform on Facebook – a social hub for all things Mommy-ish. She also owns and operates a fabulous online shop called Little Saturday Market – a smart way for parents in the Greater Toronto Area to buy/sell pre-loved kids, maternity & baby-wearing apparel and a practical service we have used multiple times ourselves. You can read the reasons we love LSM so much here. 1) Tell us a little bit about yourself, your family and the purpose behind your business/project/platform? I’m Andrea. A busy, sleep deprived, yet very happy, work-at-home mom with two little ones (four year old boy and two year old girl). I am the founder and voice behind the Modern Mommy Collective, as well as the founder/owner/operator of LittleSaturdayMarket.com. My online platform, Modern Mommy Collective (MMC) was born out of my fascination of the role social media plays in parenting these days. MMC is intended to be an online forum/resource for moms looking for an escape from all the textbook parenting advice out there. I curate content based on things I find inspiring and share my own reflections on motherhood that I hope can shed a positive light on motherhood. My goal is to make mom not feel alone. It has evolved with me as a mom and is changing as I learn and grow. LittleSaturdayMarket.com is an easier/smarter way for parents to pass along/share clothes. Somewhere to aggregate the best in prel-oved kids stuff; Essentially a central place for parents to shop, with the piece of mind knowing that a mom has curated and handpicked it all. It’s an affordable, easy, stylish and eco-conscious alternative to the traditional retail experience. It’s a more sustainable way to shop for children’s apparel. 2) When did you begin your business/project/platform and what propelled you to make the leap? Is it a “side-hustle” or full-time endeavour? Do you have another career also? My son was 3 months old when I felt the need to start connecting with other moms and create my own social media experience/platform. I wanted a creative outlet for the challenges, joys and straight up absurdity of this whole motherhood thing. I started LittleSaturdayMarket.com (LSM) when my daughter was 10 months also, my son was still two (yikes!). It’s a serious side-hustle thing. I am momming 24/7 these days and have been since my son was born. I was doing more marketing consulting work when I just had my son but had to take a slight step back from that with having both kids with me all the time. I pick and choose partnerships here and there but really have had to scale that back, for now. Especially since starting up and running LSM takes up A LOT of my time. I plan to ramp back up on the marketing stuff when some time frees up (when the kids go to college?!). Seriously though, in September my son starts JK so I should have some more focused work time and take on more marketing projects again. 3) What was your “why” for starting your business/project/digital platform? Parenting is hard and it doesn’t get easier. We are missing that real-world village that previous generations had, so I wanted to create a place online to connect with moms. I got tired of the one-size-fits-all parenting advice and gravitated towards moms sharing their own experiences. I started writing about my experiences and it was well received. People would write me and tell me it helped them. That they thought they were the only one struggling with <insert endless parenting challenges here>. It was inspiring and encouraged me to keep going. Little Saturday Market is a combination of the marketing geek/kids fashion obsessed/former project manager in me. When I learned about all the environmental concerns around the growing “fast fashion” trend, I had a hard time ignoring it. I am working to change the perspective and rebrand the idea of “second hand” through my shop. It’s a great resource for parents. It just makes sense to have someone collecting and aggregating the best pre-loved items in on central places. It’s a lot of work but I have a lot of happy sellers and customers and it keeps growing. I have had many people tell me that they never would have considered buying second hand clothes for their children, let alone online, but that my efforts and shop have changed their perspective on it. They are now repeat customers. That means everything to me and means that my message is getting across. It’s been so motivating. On a separate note, I think it’s important to be passionate about things and have an identity outside of being a mom. 4) One of the biggest blocks to Moms acting on their aspirations is finding the time. How do you make time amidst a busy family life to pursue your passions and/or meet your business goals? Time. That’s something that doesn’t come my way easily these days. I had to figure out how to weave my work into our days in a way that wasn’t too disruptive and also is realistic considering I’m both my kids’ full time caregiver. That means essentially “stealing” time. Unfortunately that comes with some guilt. Guilt about being on my phone or carting kids around with me for pick-ups or meetings, guilt about using the iPad as a babysitter at times. I really try to be present when I’m with my kids and often feel bad working a lot around them. Although it’s inevitable that my mommying and working mix together a lot these days, I do try to keep it as separate as possible. I have learned to become a night owl. At the same time the kids have learned that I work, too. They are bright kids and I explain to them everything about how I have to work and take care of them at the same time…and that it’s hard. I am teaching them to try and be independent and patient. It’s not easy but they are way more understanding than I thought they would have been. I have no downtime during the day and find it most relaxing to work after everyone’s asleep. Unfortunately that means many late nights. But it’s important and I find it oddly recharging to stay-up-late working on things I am passionate about outside motherhood. I never stop thinking about my business. I’m so passionate about my LSM and MMC projects, I can’t help but constantly want to work on them, whenever possible. Somehow I find time. But I also haven’t watched TV or a movie in months, I guess working is my hobby these days. 5) Have you met any resistance/judgement/blocks/obstacles while pursuing your endeavour? If so, what were they & how did you persevere? My family and friends have been super supportive of it all. A certain two year old and four year old could be considered obstacles but I instead find them to be my motivators. They encourage me to keep going to make them proud. They may not understand it yet and also may find it frustrating at times to compete for my attention, but one day it will make great sense to them. The aforementioned guilt is an obstacle. It’s unescapable. I’ve been working on releasing myself from the guilt an trying to get better about asking for help. On the blogging side, it’s hard not to get caught up in the online popularity contest that the internet is these days. I remember thinking back to when I had 43 followers on my Facebook page (now almost 20,000). 43 felt meagre in social media terms. So I pictured 43 women standing in a room, listening to what I had to say, connecting with likeminded moms anywhere in the world. That’s impactful enough for me. If my blog post or writing could help one mom not feel bad about herself, have a laugh or be a bit inspired, it makes it worth it for me. Screw the numbers on the internet. I used to worry about that. On Instagram I know how to get lots of followers fast but I want an authentic community. It got easier when I realized that I just wanted to connect with people and share my story–not get “likes and follows”. There are click farms overseas that can take care of that for you but you lose the “community” with that approach. Another obstacle has been balancing my public profile with my personal profile. I have always wanted clear boundaries. I don’t talk in detail about my personal relationships and avoid showing my kids in super raw and challenging moments. I know this is relatable but I respect the fact that they didn’t sign up for this. I made a rule that I would only share things about them that I would be proud to show them one day. That allowed me to draw a pretty clear line in the sand. I realize that the over-sharers are dominating the mommy blogging world but it’s just not totally for me. I’m inspired by moms that are open and fearless in their reflections on motherhood. I really am. I try to be as open as possible without putting my personal life on display. So I guess I’m my own obstacle at times, but in a good way. I know the things that I could talk about or share that would generate a major response but boundaries are important to me. I’m happy that I’ve still been able to carve out a relatable platform for myself and that my writing and community has been well received. But ya, you’re constantly battling the balancing act in your head–what to share, what not to share. It’s tricky. On the online shop side the obstacles are less matters of the heart and more matters of time, logistics, technology–practical things. I had to figure out how to run my business from my mobile phone (I rarely have time to sit down in any sort of office environment). I also had to figure out how to run the business most efficiently to make it make sense to run on what are frankly quite small margins. I’ve got a good system and am learning everyday. On a more personal note I did worry about the business failing. As an entrepreneur, building a brand and business from the ground up without the proper time and resources is scary and humbling. I’m lucky that I’ve had so many people become cheerleaders, supporters and patrons that it’s kept me going. It’s encouraging to have people put blind faith in you and to see your children watching you work towards something and build something, to see me be passionate about something and achieve my goals. These are important things I want to breed into my children. It keeps me going. If someone could just work on adding more hours in a day, a teleportation device and one of those handsfree beer hats but for coffee, we’d be all set. My kids–I do what I do so I can spend as much time as possible with them while also earning my keep and following my passions. This is the example I want to set for them. My husband inspires me. He tells me he’s proud of me everyday. My parents–they are not only amazing parents but my dad is a fearless entreprenuer who started his business as a new dad in the recession and my mom decided to do a complete career switch when she was in her 50’s. They’ve inspired me to work hard, be passionate and fearless. Other moms who share openly and fearlessly, as I mentioned before. Entrepreneurs and small business owners–I didn’t realize how brave and hardworking they were until I tried starting my own business. It’s so challenging and humbling. 7) What advice or encouragement would you give a Mom who is ready to take the leap, but feels stuck or fearful? Just try it. And do it for the right reasons. By that I mean–Don’t start something to try to impress people or gain followers or become rich. I never wanted to come across as “look at me doing everything perfectly” or as a narcissist in an environment filled with that. But it’s ok to be proud and confident. And to share that with your network. People will support you. Not everyone, but the people you want in your circle. Be real and honest. The content that has been most successful for me is always about being far from perfect. Do it because you are passionate about it and find it fulfilling. Don’t be afraid of failure. Things fail all the time and people survive to tell the tale. Odds are you won’t fail. Odds are you will be super successful, proud of yourself and won’t believe what you can accomplish. But if not, that’s OK too. You can try something else. Whatever you’ve been thinking about starting or doing, just do it. And once that “thing you’ve been dreaming about” gets rolling, be OK with taking it at a pace that works for you and your family. I have so much that I want to do with my Modern Mommy Collective platform and LittleSaturdayMarket.com, but I know that my #1 priority and most important job right now is my family. That means that I need to take it slower than I’d want to and be OK with that. It’s frustrating at times considering I am knee deep in parenting little ones. And I want to enjoy that experience too. I know I will soon have tons of time to pour into my business endeavours and these years with little ones hanging off of me will go by quickly. Remind yourself of that often. It’s the attitude you need to work towards your goal while also being in the parenting trenches. Building a business or community while being a mom is hard. Don’t let this pace discourage you. You will figure it all out, somehow. Think of the advice you would give your kids. They are watching you, so make them proud and be fearless. It’s not easy. Please don’t fall for any company or gimmick that tells you that you are going to be working from home, making six figures and loving life without having to work that hard. That’s impossible. Expect to pour all your extra time and effort into your endeavour. Sounds onerous, but if it’s something you’re passionate about, it won’t make it as miserable as it sounds. Don’t go quitting your day job too soon. Expect what you’re doing to be a side business for a bit. Too much financial pressure on your efforts may totally kill your vibe and make you quit too soon. Most importantly–don’t be afraid to figure it out as you go. This is the only way. I could go on all day about this. Happy to chat with anyone if they wanted to contact me. 8) What motivates you to keep going, even when it gets overwhelming? My kids. The example I’m setting for them. The messages of people telling me that they are in the same boat as me when they read my blog posts. That what I’ve said has reassured them or that they could relate to what I was trying to say. That Little Saturday Market has lightened the burden of fast fashion on the environment, even if it’s just in a small way. It’s nice to know you are making a difference, regardless how small. My four year old asks if he can recycle things when he’s done with them and I’d like to think that is a result of all the talk about recycling clothes in our house. I also find it motivating to get “thank you’s” from moms who don’t have access or time to shop quality pre-loved apparel. We take this for granted in the cities and surrounding areas. Oh and I guess the fact that I have told almost 100 moms that I’d promise to sell their gently used children’s apparel. There’s that. 9) How has your family responded to your endeavour? Great. My kids help me and I try and incorporate them into my work wherever possible. Turns out, that wee ones can be quite helpful from a business sense when they feel like it <–operative phrase there. All joking aside, nothing but support around here. I haven’t heard one complaint ever even though my “side-hustle” does take up all of my free time, and then some. That you have to just figure it out as you go. There is no book on this. I mean, there’s tons of books on parenting, but no books on your kids, no books on how to combat the heavy stuff. Only experience and mom strength will get you through that–a strength that we all have in us even when we don’t feel like we do. The doubt and guilt will always be there but it can’t dominate you. Balance is not something that you will ever feel like you are able to achieve so pick your priorities wisely. You need to find your own ways to recharge in ways that are practical and realistic for you or you will burn out. The books can’t teach you about the real challenges of motherhood–the emotional side. That’s up to you. It’s crucial to be surrounded by people who can build you back up when the weight of motherhood pushes you down. Even when you feel alone, those feelings that you’ve felt (good and bad) have been felt by parents everywhere since the beginning of time. We have persevered. Moms are tough. You are one of those moms you are inspired by even though you don’t always feel that way. We are all just winging it. And even Kate Middleton has probably snuck the licked scraps of her kids soggy half-eaten grilled cheese. Motherhood is the great equalizer. We are all in this together. Don’t compare, just be inspired. Thank you so much for sharing your journey, Andrea. It was such a pleasure to connect and hear your perspective.